The tech industry is booming across the country. From big cities to small ones, successful startups are taking root, and job prospects for tech workers are rising precipitously and show no signs of stopping. Lots of people want to get in on the tech boom, and SmartAsset wanted to find out what cities are truly making the most of it. This is the 2014 version of SmartAsset’s study. See the 2015 version here. 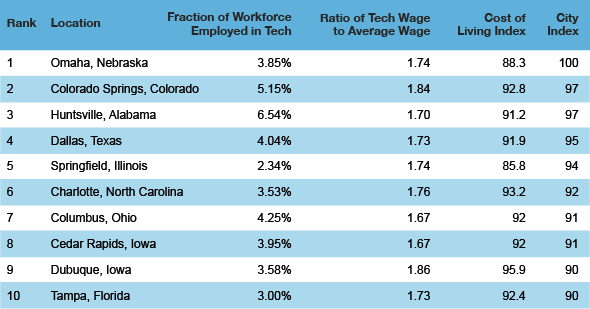 For two hundred cities, we collected data on average wages for all workers, average wages for tech workers and percentage of all workers who are employed in tech from the Bureau of Labor Statistics. We also looked at the cost of living index for each city from the Census Bureau. We then ranked the cities for three categories, giving high marks for high relative pay for tech workers, high percentages of tech workers in the workforce (representing high levels of opportunity in the field) and low cost of living indices. The total of these three rankings became the cities’ overall tech industry scores. Omaha has five Fortune 500 companies – a full one percent of the entire index – headquartered within its city limits. Four of them are global-scale firms which need a lot of tech infrastructure support (food manufacturer ConAgra, America’s biggest train operator Union Pacific, construction goliath Kiewit, and national insurers Mutual of Omaha), and the fifth is Warren Buffett’s holding company (a phrase which hardly does the scale of the thing justice) Berkshire Hathaway. Omaha benefits from average internet speeds of 35.6 megabytes per second, which is 50 percent greater than the national average. The costs of living there are a mere 88.3 percent of the national average, 3.8 percent of all Omaha workers are tech employees, and those tech workers make 74 percent more than the city average. 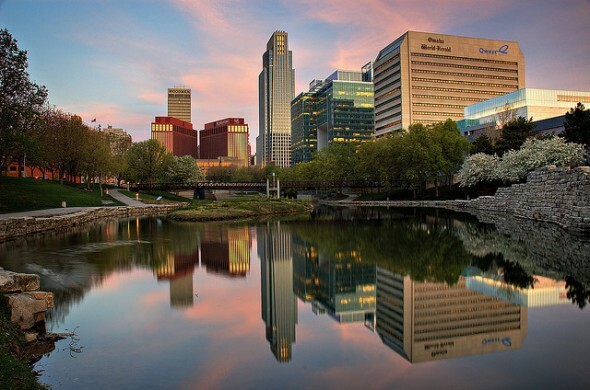 Besides the diversity and strength of the industries in Omaha, which also include the country’s largest privately-held bank, numerous energy producers and the Gallup polling organization, some draws of the city are its frontier history and the NCAA Baseball College World Series tournament. Colorado Springs is the second-largest city in Colorado after Denver, and although it may not be as well-known as the state capital, it has plenty of claims to fame on its own. It is located at the base of the iconic mountain of the American west, Pikes Peak. Colorado Springs is responsible for manufacturing a lot of the United States’ high-tech equipment, including servers and semiconductors. Colorado Springs also has longtime military ties, with the United States Air Force Academy located there, as well as major defense contractors, and the nonprofit Space Foundation, which is dedicated to raising money to continue human exploration of outer space. The cost of living in Colorado Springs is 92.8 percent of the national average, 5 percent of all employees there work in tech, and those tech workers make 84 percent more than the city average. Located in the far north of Alabama, Huntsville is nicknamed the “Rocket City” because of its contributions to America’s space race efforts. The main linchpins of Huntsville’s economy, which employs 6.5 percent tech workers (the highest on our top ten list), continue to be NASA’s Marshall Space Flight Center and the US Army Aviation and Missile Command. The University of Alabama-Huntsville also drives the tech sector with its engineering degree programs. Huntsville’s cost of living index is 91.2 percent of the average. Dallas has always had something of a cowboy reputation, but it is now home to some very modern companies and industries. The headquarters of electronics manufacturer Texas Instruments is in Dallas, and the city also has major offices of AT&T and ExxonMobil. The Dallas area is even sometimes nicknamed “Silicon Prairie.” About 4 percent of all Dallas workers are in the tech industry, and they make 73 percent higher wages than the city average. The Illinois capital, Springfield, has one particularly noteworthy geographical feature that is also connected to its tech industry. Lake Springfield is an artificial body of water owned by the City Water, Light and Power company, and this utilities firm provides many of the tech jobs that account for Springfield’s 2.3 percent technology employment. Living in Springfield is a relative bargain, with a cost of living that’s just 85.8 percent of the national average (the lowest cost of living on our top ten list). Charlotte is perhaps the biggest financial center of the South and one of the biggest on the East Coast. The Queen City is home to the East Coast centers of operations for Bank of America and Wells Fargo, as well as other major bank offices. More than 3.5 percent of Charlotte workers are in the tech sector. The central Ohio city of Columbus is home to Ohio State University. This is significant to the tech industry because of the school’s Ohio Supercomputer Center, dedicated to research on the upper limits of high-powered computing. The Department of Defense’s Finance and Accounting Service has one of its major processing centers in Columbus, so many of the city’s 4.3 percent of tech workers are involved in handling military finances. By far the largest employer in Cedar Rapids is the headquarters of Fortune 500 air navigation and communication manufacturer Rockwell Collins, which helps account for the city’s 4 percent of tech workers. Dutch insurance multinational corporation Aegon also has its United States offices in Cedar Rapids. City residents pay only 92 percent of the national average cost of living. Dubuque is one of the hilliest cities in the otherwise flat state of Iowa. Besides its picturesque geography, Dubuque has a large number of manufacturing firms which require the precision that the tech industry can provide in order to turn out products like heavy farm machinery. Dubuque has low unemployment, at 4.3 percent, compared to the 6 percent national average. Tech workers there make 1.86 times more than the city average, the highest ratio on our top ten list. Tampa, on the west coast of Florida, has warm, sunny weather year round except for the occasional hurricane. The city is home to the headquarters of a number of Fortune 1000 companies, as well as the military aviation industry as personified by MacDill Air Force Base. About 3 percent of Tampa’s workers are in the tech industry. The Hawaiian capital benefits from a 4.5 percent unemployment rate as well as close to 2 percent of its workforce in the tech sector. But tech workers can make much better relative money elsewhere because of the Hawaiian Islands’ 165 percent cost of living index (the highest on our bottom ten list). While Lafayette is home to Purdue University, whose graduates may go into the tech industry, only 1.17 percent of the city’s workforce works in technology. Tech workers only make 47 percent higher than the city average with a cost of living index that is close to the national average at 98.2. 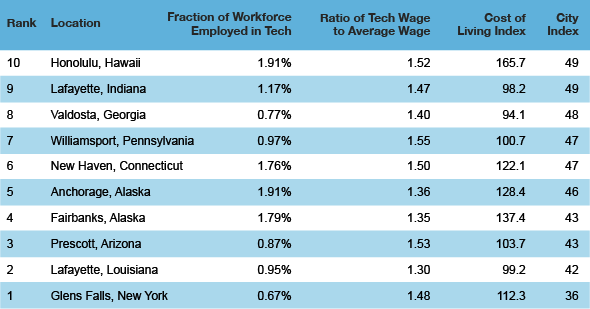 Tech workers are better off elsewhere in the Midwest in order to get higher relative wages. The Azalea City has the swiftest-shrinking population of any major US city, according to the US Census. Less than 0.8 percent of the working population works in technology, and unemployment is quite high at 8.2 percent. Considered the birthplace of Little League Baseball, Williamsport has quite fast internet on average at 39 megabytes per second. Unfortunately, just 1 percent of its workforce is in the tech industry, and its cost of living is above the national average at 100.7 percent. New Haven is home to Yale, but fewer than 1.8 percent of the city’s workers are in the tech sector, and its cost of living is somewhat daunting, at 122 percent of the national average. Anchorage’s remoteness contributes to the high cost of living (128 percent of the national average), and its tech workers make one of the lowest relative wages among major cities in the country, with only 36 percent higher salaries than the city average. Fairbanks has some of the slowest internet among major cities in the United States, with 10.5 megabytes per second speeds, less than half the national average. Fairbanks tech workers face an even higher cost of living index (137 percent) than Anchorage’s do, and make a similar relative wage. Only about 0.87 percent of Prescott’s workforce is in the tech sector, and the city has a nearly 104 percent cost of living index. So there are not many tech workers there and those that are pay slightly more to live there than the national average. Lafayette tech workers make only 30 percent more money than the city average of all workers (this is the smallest ratio in our bottom ten list). The average tech salary in Lafayette is $17,000 less than the national average with a cost of living index right at the national average. The Northeastern New York city of Glens Falls isn’t the absolute worst in any category. But having only 0.67 percent of its workers in the tech industry indicates low opportunity (this is the lowest number in our bottom ten list), a 112 percent cost of living index makes it quite expensive and the fact that its tech workers only make 47.5 percent higher wages than the overall city average makes this the most discouraging city for tech workers. Read the 2015 version of SmartAsset’s study of the Top Ten Cities to be a Tech Worker. Alex Silady Alex is a graduate of New York University's journalism school. He has penned and edited articles, features and videos for news, politics and entertainment websites, both in the US and abroad. His specialties are archival research and the history of finance. His areas of expertise include home buying, small businesses and banking. Alex's hobbies include video games, especially RPGs, and following NHL hockey.